A Professional Development Workshop for Counsellors and Therapists who wish to work with or are currently working with couples. As Counsellors who are interested in the complicated, complex and challenging world of primary relationships, which puts greater demands on our skills and attention; how do we work with two people and the dynamic they create? You probably already know that you are working with 3 clients – there are two people and the relationship sitting at the table. But how do you do that? How do you counsel a relationship? How do you empathize with both clients if they have opposite points of view and differing stories? If they end up separating does that mean you’ve failed? Are you only successful if you keep couples together? Compared to an individual client, a relationship is a different counselling process that requires different skills from the therapist. What are those skills? What should you focus on? You are an active disrupter of a relationship pattern – what impact are you having on the process? Are you the 4th one sitting at the table? What are you supposed to do with all the emotional and personal history that your clients bring up for you? There are many approaches to working therapeutically with couples in primary relationship. These approaches differ in focus, process, and goals. 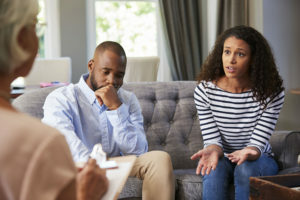 This overview of the process of relationship counselling provides information that is fundamental to counselling, but not representative of any one theoretical orientation. For new counsellors and seasoned professionals alike – this workshop explores the emotional dynamic underlying all primary relationships, examines common issues and challenges the counsellor may encounter, and discusses methods of supporting the couple’s movement towards deeper emotional contact and commitment. This workshop will count for 4 hours of Professional Development. A certificate will be provided to all those who attend and complete the workshop. Working as a couple in relationship has given Steve and Maria a deeper understanding of relationship dynamics — and they bring this knowledge into their therapeutic practice. As Instructors at Clearmind International (often teaching classes together), and as counsellors in their joint practice, Metta Emergence, Steve and Maria have accrued more than 13,000 hours working with clients and groups. They have supported couples to reach their counselling goals for more than 15 years, within session work and relationship support groups. As Registered Counselling Supervisors, they provide individual and group supervision sessions to fellow therapists. In 2017 they led an ACCT Professional Development session on Couples Therapy Skills Development. Steve Pritchard is a Master Therapeutic Counsellor (MTC), Registered Counselling Supervisor (RCS), Certified Hypnotherapist and has been an Instructor of the 3-year Counsellor Training Diploma Program with Clearmind International Institute for 14 years. Steve believes deeply that we all have to power to expand ourselves beyond our limiting thoughts and beliefs. This deep realisation brings empowerment and direction to our lives, where we may have once felt alone, neglected or, left behind. He strives to bring understanding, clarity, compassion and enthusiasm to his work in supporting individuals and couples to create a life of authenticity and purpose. Steve has worked as a Crisis Centre staff member, providing crisis counselling to both walk-in and telephone clients, as well as training for new volunteers. Additionally, he has supported adults with physical and mental disabilities in both home and work situations throughout the province of BC. As a Counselling Therapist, Steve sees individuals and couples in-person, or via Zoom and Skype. Maria Alexandre is a Master Therapeutic Counsellor (MTC) and a Registered Counselling Supervisor (RCS), providing professional supervision to counsellors and others working in the counselling field. For the past 15 years, she has been an Instructor of the 3-year Counsellor Training Diploma Program with Clearmind International Institute. In her private practice, Maria’s holistic approach focuses on helping clients understand their challenges, move beyond unhealthy thought and behaviour patterns, and move toward authentic self-expression — all leading to a greater capacity to create a deeply fulfilling life. Her passion lies in helping people change their minds about the purpose of their life transitions, challenges, initiations and difficulties. As a Counselling Therapist, Maria sees individuals and couples in-person, or via Zoom and Skype. For more information about Steve and Maria’s work, please visit mettaemergence.com.